Brimming with overconfidence, few on board the Japanese carrier Soryu noticed the SBD Dauntless bombers gathering overhead. Within a matter of minutes a few courageous US Navy pilots would change the course of history. Thursday 4 June 1942, and Admiral Yamamoto’s plan to draw what remained of the US Pacific fleet into battle was going well. That morning, before dawn, he had launched over a hundred aircraft to pound Midway’s power plants and oil installations, and the attack had been successful. Now, with his aircraft returned, re- fuelled and re-armed he prepared to launch a second strike to deliver the coup de grace. By 10.20 the noise on the carrier’s packed flight decks reached a crescendo as the pilots ran up their engines whilst the Sôryû turned slowly into the wind ready to launch. Few were watching the sky above. They failed to spot the SBD Dauntless dive-bombers from the USS Yorktown gathering high overhead. No one noticed as the battle-hardened pilots of VB-3 banked their SBDs and, swooping like hawks on their prey, dived on the carrier below. 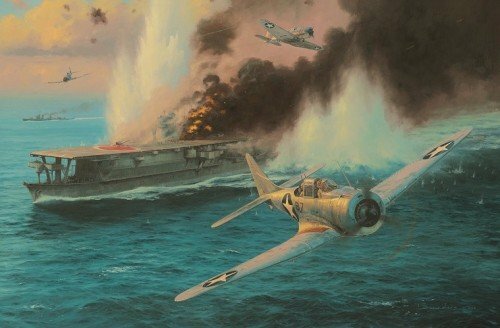 Anthony Saunders’ action-packed painting recreates the scene as the SBD pilots pull out of their death-defying dives having delivered their 1000lb bombs perfectly on target with three direct hits. Already there is utter chaos aboard the Sôryû as exploding ammunition and igniting fuel erupt onto the flight deck from the hangars below. Secondary explosions rip through the ship, fires rage beyond control and her hull shudders to contain the violent inferno. The Sôryû is doomed.